Benjamin T. Horton manages complex litigation involving high tech patents. He has a degree in electrical engineering, and before law school he worked for technology companies in the automotive and semiconductor industries. He is a member of the Trial Bar for the Northern District of Illinois and litigates intellectual property cases in federal courts across the country. 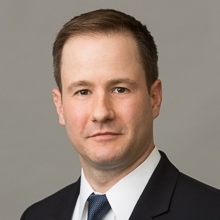 Mr. Horton also practices before the Patent Trial and Appeals Board, representing both petitioners and patent owners in inter partes review (IPR) and covered business method review (CBM) proceedings. Mr. Horton speaks regularly on patent litigation and strategy and he is a frequent contributor to various IP publications. SuperLawyers, a Chicago Magazine publication, selected Mr. Horton for the 2012–2016 Illinois Rising Stars® lists, which feature top attorneys in intellectual property law. Mr. Horton has been selected as one of the “World’s Leading Patent Practitioners” in 2016 by Intellectual Asset Management (IAM) magazine. He was also selected as a 2015 and 2016 “Emerging Lawyer” in Emerging Lawyers Magazine as a top Illinois attorney under 40, and was profiled in the November 2016 issue. Mr. Horton has also been recognized by intellectual property publications such as InsideCounsel, Thomson Reuters, Intellectual Property Magazine, Law360, and IPPro. Representing semiconductor manufacturer in litigation with rival involving micro-electro-mechanical system (MEM) technology. Representing LED manufacturer against competitor in district court litigation. Representing patent owner in IPR proceeding, successfully defending 27 of 30 originally challenged claims against institution, the remaining claims proceeding to trial. Defended multi-defendant patent litigation involving cellular data packet technology. Represented global manufacturer in international electrical power product litigation to favorable resolution. This patent and antitrust case involved fifteen U.S. patents spanning multiple countries and hundreds of products. Represented patent owner in IPR proceeding, successfully defending as patentable all challenged claims through trial. With over $30 million at stake in a patent infringement action between HDTV component manufacturing rivals, secured non-infringement jury verdict after a three week trial. Secured non-infringement jury verdict after successful defense involving multiple copyrights. Represented author and film producer in copyright, contract, and bankruptcy dispute in federal court. Achieved favorable disposition in defense of global manufacturer by defeating plaintiff in the claim construction phase of patent infringement action involving arc fault circuit interrupters. Secured a favorable ruling and damages award for plaintiff in arbitration involving contract dispute and fraud. Represented global manufacturer of electronically timed construction explosives in patent infringement litigation against multiple competitors in multiple jurisdictions. Won summary judgment in patent infringement action in defense of overseas manufacturer of wireless tracking devices. Represented child safety seat manufacturer in patent infringement dispute, obtained favorable outcome with witness deposition testimony and aggressive motion practice. Represented manufacturer of networked air quality monitoring systems in patent infringement litigation through appeal to the Federal Circuit. Mr. Horton specialized in microwave circuit design and antennas as an undergraduate in electrical engineering at the University of Michigan in Ann Arbor. He went on to work for Panasonic Semiconductor as a field applications engineer assisting in the design of automotive, cell phone, and display technology components. He also worked for Motorola Semiconductor as a co-op field applications engineer working with Ford Motor Company and DaimlerChrysler Corporation. Mr. Horton received his J.D. from DePaul University College of Law and his B.S.E. in electrical engineering from the University of Michigan, with honors. "Patent Litigation Trends to Watch in 2018," Law360, January 1, 2018 (featured quotes). “Fee Shifting in Patent Litigation,” 2017 IP Defense Summit, Boston, MA, May 10, 2017. “Forum Shopping Case to be Heard Next Week,” IPPro Patents, March 24, 2017 (featured quotes). “Ben Horton – Neutralizing ‘Patent Trolls’ for His Clients,” Emerging Lawyers Magazine, November 2016 (profile). “Venue patent reform 'necessary and urgent' claims new Bill,” Intellectual Property Magazine, July 19, 2016 (featured quotes).